First, don’t panic. You are not alone. If you’re visiting Tripawds for the first time, you are likely overwhelmed, and not sure where to begin. Breathe, slow down and learn how to Be More Dog. Know that you have found the best place for pet amputation information, resources and support from others. Download this page as a PDF to read offline. Please take a moment and follow these steps below to get the most benefit from this website. Read all the way through and enjoy a special gift too! Overwhelmed? Want to talk? Call the toll-free Tripawds Pals Helpline! 1. Take a minute to read this page. We are sorry to hear that your dog or cat may need an amputation, or perhaps is now recovering from surgery. But we are glad you found us! Please know that everyone who joins Tripawds understands exactly what you’re going through. Scroll down for fast answers and e-book coupon! For now, please read on to learn how to connect with our community and use this site. Anyone can post in the discussion forums! Registered members, however, will not need to have their posts approved. Members can also complete a user profile, and use Private Messaging to communicate directly with other members. Registration is required to join the Tripawds Live Chat room, where members are often waiting to greet newcomers. Pop in and stay a while to ask questions and make new friends! During the registration process, you had the option to start a free blog. If you didn’t create one, that’s OK. You can add a blog any time. Your blog is a great way to document your Tripawd Journey, upload photos and share videos. Start a new forum topic. Submit a Tripawd Tuesday feature. Pay tribute on the Tripawds Honor Roll! 3. Get familiar with this website. Tripawds has a wealth of information to offer. In fact one of the only complaints we receive is that there is too much information. Take just two minutes to watch this video describing the site’s primary features. Still need help navigating the site? Don’t know how to post in the forums? Watch this tutorial video! 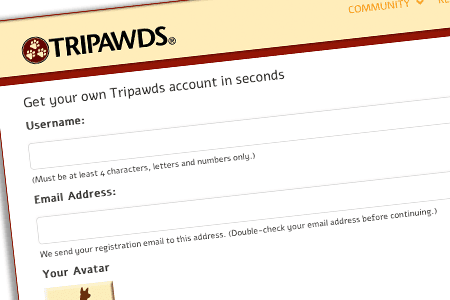 Tripawds is a network of blogs, not just one website. You are currently viewing the main site. Watch the Tripawds Tutorial Video for more help navigating the many available resources! NOTE: Registered members will also see their very own black “Admin Bar” at the very top of every blog on the Tripawds network. 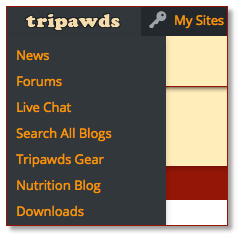 This bar includes links to your Tripawds dashboard, and an additional menu with quick links so you are never lost. Another reason to join Tripawds now! See all Tripawds Foundation Assistance Programs and see if you qualify. 4. Bookmark the reading list. One of the best places to start here is by reviewing and bookmarking Jerry’s Required Reading List. Do that now, we’ll wait… This ever-growing list includes links to many of the best blog posts, forum topics, veterinarian interviews, videos and podcasts in Tripawds history. 5. Search the blogs and forums. If you have questions—and we’re sure you do—they have likely been answered in the Tripawds Discussion Forums. The forums are this community’s most popular, and most helpful resource. First, take a moment to search the thousands of topics for any specific concerns. Next, pick a forum and start a new topic. Introduce yourself, tell us about your dog or cat. Oftentimes you will receive replies from members within minutes. Remember, Tripawds hosts five featured blogs and 1,000+ member blogs too! Many members share their success stories, treatment plans, helpful recommendations and more. You can search all blogs here. 6. Download e-books for fast answers. Three Legs And A Spare is the must have canine amputation handbook for anyone faced with their dog losing a limb. Loving Life On Three Legs is filled with professional tips for keeping Tripawds fit and strong. And The Tripawds Library includes both e-books, plus lots of extras, for one low price. Now that you know your way around here, you’ll want to receive the latest updates and important announcements from Tripawds! Check out the subscribtions page for details or subscribe to the Tripawds News blog and newsletter below. Twice a month we send out Tripawds News to show what you’ve missed in the blogs and forums. We include important blog posts and popular forum topics as well as greatest hits from more than seven years of Tripawds archives. Oh, and we’ll give you a special gift for opting in too! Again, you can unsubscribe any time and we will never send you spam. Subscribe to receive Tripawds News! Sign up to be notified by email of Jerry’s new blog posts. Enter your email below and you’ll be automatically added to the list. Unsubscribe anytime and keep your free gift! 8. Join us on social media. Use your favorite social network icons below to subscribe to the RSS feed for all Tripawds Blogs, or follow us on Twitter. Like the Tripawds Facebook page to keep informed, and catch the latest videos and photos on Youtube, Pinterest and Instagram. 9. Support your Tripawds community! The free Tripawds blogs, forums, live chat and many other resources cost money to maintain. It’s only made possible through generous Tripawds Supporters and our charitable organization, the Tripawds Foundation—a 501c3 public charity formed with the mission to help amputee pets and their people everywhere. If you find this site helpful, there are various ways to Support Tripawds! Or, make a charitable contribution to help keep this community online, and we’ll pay tribute to your three legged hero or angel on the Tripawds Honor Roll. Now that you are an expert in all things Tripawd, tell your vets, friends and family! Use the sharing buttons below to help spread the word about everything this community has to offer. 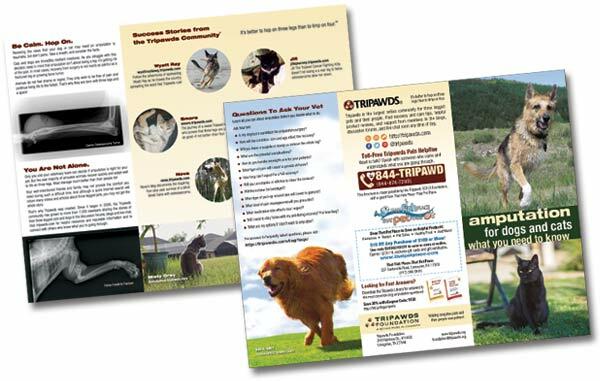 Send your vet Free Tripawds Brochures to help other concerned pet parents facing amputation for their dogs and cats. Then, name your price for a dog bandanna and check out our custom pet-centric jewelry or visit the Tripawds Gift Shop for t-shirts, hoodies, and all sorts of gifts with three legged dog and cat designs. Let’s all show the world that Tripawds Rule!